We need a curch ,,, and the are so many ..
Philippine cuisine consists of the foods, preparation methods and eating customs found in the Philippines. The style of cooking and the foods associated with it have evolved over several centuries from its Austronesian origins to a mixed cuisine with many Hispanic, Chinese, American, and other Asian influences adapted to indigenous ingredients and the local palate. Dishes range from the very simple, like a meal of fried salted fish and rice, to the elaborate paellas and cocidos created for fiestas. Popular dishes include lechón (whole roasted pig), longganisa (Philippine sausage), tapa (cured beef), torta (omelette), adobo (chicken and/or pork braised in garlic, vinegar, oil and soy sauce, or cooked until dry), kaldereta (meat in tomato sauce stew), mechado (larded beef in soy and tomato sauce), puchero (beef in bananas and tomato sauce), afritada (chicken and/or pork simmered in a tomato sauce with vegetables), kare-kare (oxtail and vegetables cooked in peanut sauce), crispy pata (deep-fried pig's leg), hamonado (pork sweetened in pineapple sauce), sinigang (meat or seafood in sour broth), pancit (noodles), and lumpia (fresh or fried spring rolls). 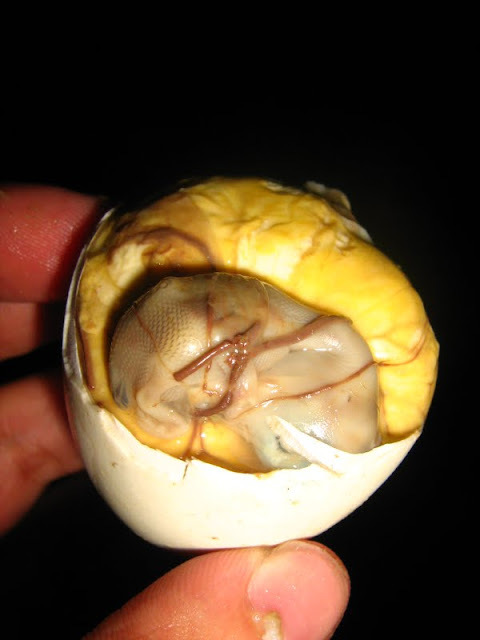 The most famous street food the Filipinos are known for is balot or balut to some. It has been part of "Pinoy" culture and considered an exotic delicacy. A balut is incubated fertilized eggs (chicken, but mostly duck eggs) that are boiled when the embryo reached 16 to 18 days old. It is eaten in shell and could be served with some salt and vinegar while some like it to be served with beer. Balut is known as an aphrodisiac and a hearty snack.